The orbit command has additional features; it will keep the heading (front of multirotor) pointed to the center and if the altitude of the point of interest and altitude of the AutoQuad is different, it will keep the camera gimbal tilted to the altitude of point of interest. This will provide a great way to circle around an object while keeping the camera pointed to the object. Missions can be created, uploaded, retrieved and stored offline using the Ground control station(s). It is even possible to load or store them on the uSD card so missions can be created at home. There are no limits in the mission waypoints, no altitude or position distances. Currently there is a 25 waypoint limit in the code because we simple don’t know yet the flash limitations for storing complex missions. The limit can obviously be changed in the firmware code for developers. Missions can be created using the GroundControl station windows or the Android GCS. Both the GCS types will allow to place a waypoint somewhere on the map, select the type and upload the mission plan to the AutoQuad flightcontroller. In this example we concentrate on the windows GCS. First connect to the AutoQuad flightcontroller using the FTDI interface. Obviously connecting with a bluetooth or Xbee device to upload/retrieve the mission is possible. Place a waypoint on the map using the mouse and select the type in the menu. You can move waypoints sequence in the list, edit them or delete them. Once satisfied you can use the write button to upload the mission to the AutoQuad flightcontroller. The buttons Save/Load WP will create or load an offline file with the created mission. Retrieving a stored mission can be done with the read button. A mission is store in volatile memory, it will be lost after a power cycle or reboot. Using the Groundcontrol station(s) an option is available to store a just created mission on the AutoQuad onboard uSD. For that a uSD must be placed in the AutoQuad flight controller. Inserting the card will trigger the log function but an store command from the ground control stations will cause the waypoint list to be stored on the uSD card. This is also available on the Android GCS in the mission planner menu. 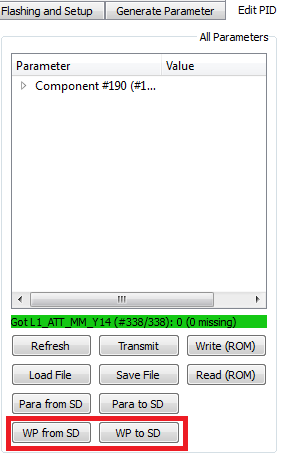 For the windows GCS select the engineer tab, AutoQuad widget. Here you will find the ‘All parameter widget’ with two buttons: WP from SD and WP to SD for loading the missionplan or saving the mission plan to the uSD card. Most of the missions will be engaged while in flight, either a hover or position hold. The mission is a sequential set of commands and will simply start at command 1. After all commands in the queue are done the mission will transition into position hold. Start a mission by switching to the mission mode ( aux 2 ) and center throttle stick . Below or above center will command an ascend or descend of the multirotor. Don’t worry about the precise midpoint, a default deadband around center of 35us will give you a neutral zone around center where nothing will happen. If that is to narrow, you can increase the deadband parameter in the configuration. Failsafe events during mission: during the execution of the mission, a radio loss signal is ignored until the last mission command is executed. At any time during the mission you can abort the execution by switching to manual mode. At that time the radio fail safe event is also active again. Once stored in the AQ as a takeoff command, a special sequence is needed to execute this command and the next mission commands. Start with the multirotor on the ground, arm the AutoQuad, switch to mission mode ( AUX2 – mission mode ) and.. this is very important, center the throttle stick. Without centering, the navigation routine will think it is in descending command, every mission should be flown with the throttle in center position. Because the throttle commands altitude change in navigation modes, a throttle not in center will command ascending or descending. 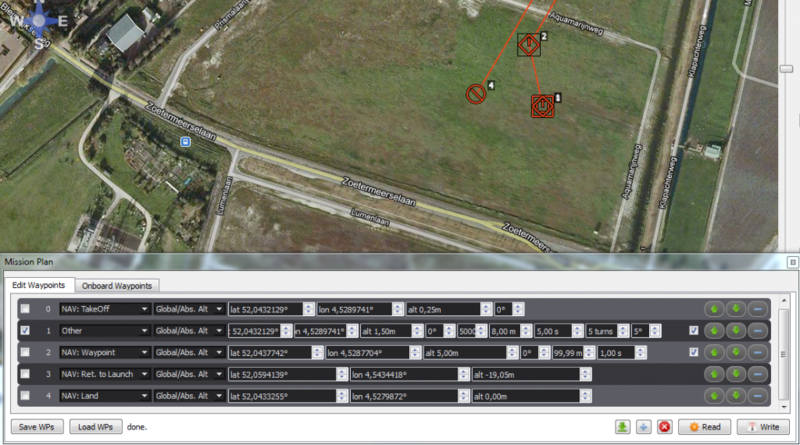 Problem: when sending the copter on a mission with several waypoints it seems to stop after the first WP is reached. Solution: If you selected a too small value for the target radius (Hit Rad.) the aircraft tries to reach the exact point. Especially under windy conditions it might take long until it hits the position precisely. Set the “Hit Rad.” to 2m or more like shown in the image below. The delay should disappear then and the copter will always continue its flight to the next WP. 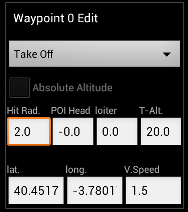 Problem: the copter doesn’t turn towards the waypoint on a mission flight but keeps the heading i.e. flying sidewards. This page was created on 18-Jun-12 by menno. Last modified on 20-Oct-15 by kinderkram.